With magic, mystery, and a dash of humor for all ages, The Magic Flute from Virginia Rep was a joy for the entire family. The opening scene set the tone for the hour-and-fifteen minute play with colorful costumes, smoke for effect, upbeat music, and laugh-out-loud humor. The well-crafted script had the adults laughing, while the children were captivated by the brightly colored costumes and the huge serpent, reminiscent of Chinese New Year. Once again, Virginia Rep knocks it out of the park when it comes to casting. The kids immediately recognized Prince Tamino from his stint in Young Tom Jefferson, and we were also excited to see Miss Clavel from Madeline’s Christmas in the role of The Queen of the Night. We all agreed that Russell Rowland was terrific as Zarastro, and we’re hoping he makes a return appearance in upcoming productions. Although I think kids love watching other kids on the stage, these eight adults with their melodious voices embraced their roles to perfection and kept the kids entertained. The six-year-old girl in our group sat on the edge of her seat through the entire play, anxious for the next turn of events. She was torn between liking the beautiful interpretation of the Queen of the Night and rooting for the lovely princess, Pamina, and handsome prince, Tamino, to live happily ever after. The youngest member of our group was three, and I have to agree with Virginia Rep’s original guidelines for attendance – the theme was over his head, but he was entertained by the vivid colors and trials put forth to the prince. The overall message of tolerance and acceptance left our group with a lot to discuss. But, in all honesty, I believe the children enjoyed reminiscing about their favorite characters more than anything. 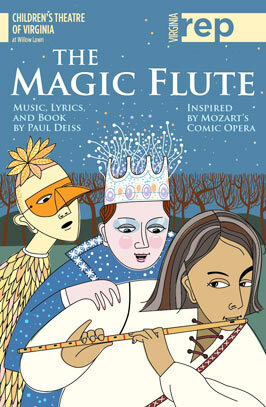 The Magic Flute is playing at Children’s Theatre at Willow Lawn through February 10. Next articleDoes Richmond Need a Freestanding Children’s Hospital?